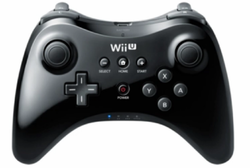 The Wii U Pro Controller is one of the compatible controllers for the Wii U. Similar in design and the successor to the Classic Controller Pro for the Wii, its purpose is to serve as a more standard alternative to the Wii U GamePad, as it features the same primary buttons as the Wii U GamePad, with it only lacking the Wii U GamePad's distinctive touchscreen. The Wii U Pro Controller was designed for players who wish to use a more traditional controller and was released alongside the console on November 18, 2012 in two colors, corresponding to the system's two colors: black and white. As stated above, the Wii U Pro Controller features all of the buttons on the Wii U GamePad without the touchscreen and some features, though some buttons are rearranged due to the shape of the controller. The two control sticks, which can be clicked, are still on the top ends of the controller, the digital triggers and shoulder buttons are on the back, and the d-pad and A/B/X/Y buttons are beneath the control sticks. The start, select, and home buttons are all on the top center of the controller, and the power button is directly under the home button. For most games, up to four Wii U Pro Controllers can be connected to the system at any given time, like with the Wii Remote. The LED lights indicating the order of the controllers are on the bottom. The controller is charged using the Wii U Pro Controller USB cable (WUP-018), a Mini-USB to USB cable which can plug into one of the system's four USB ports, while the console is powered on, and takes approximately 4.5 hours to charge The Wii U Pro Controller uses the same rechargeable lithium-ion battery as the Nintendo 3DS and Nintendo 2DS systems (CTR-003), which can last for up to 80 hours. The battery LED is located on the top of the controller, which will light red when battery power is running out, and orange while charging. ↑ 1.0 1.1 How to Charge the Wii U Pro Controller. Nintendo Support. Retrieved September 12, 2016. ↑ Wii U Pro Controller and 3DS share the same battery. GoNintendo. (November 9, 2012.) Retrieved June 5, 2015. This page was last edited on 11 December 2018, at 11:41.